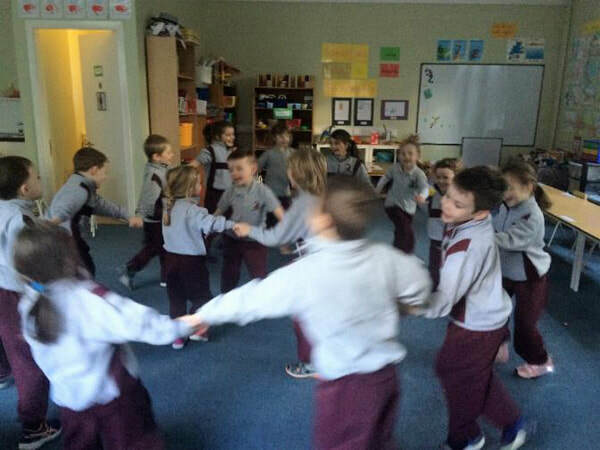 Sometimes if it’s raining and if another class is using the hall, we push back our furniture and do our p.e. inside. 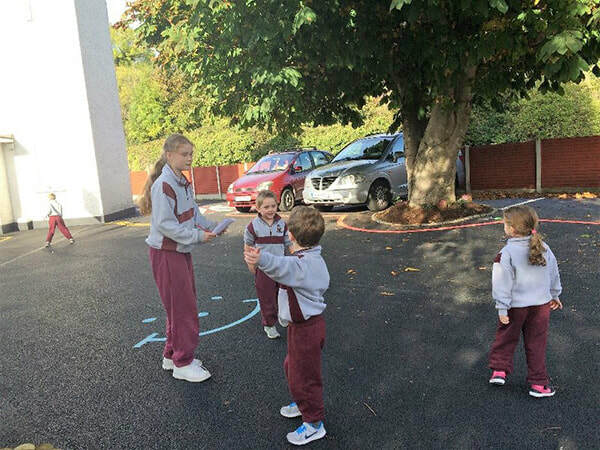 We love learning the old playground games such as “The Farmer Wants A Wife”. 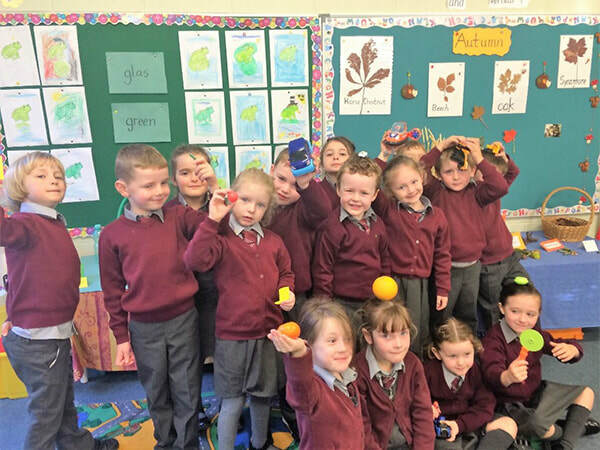 It links brilliantly with our Irish story about the feirmeoir and An Tornapa mór. 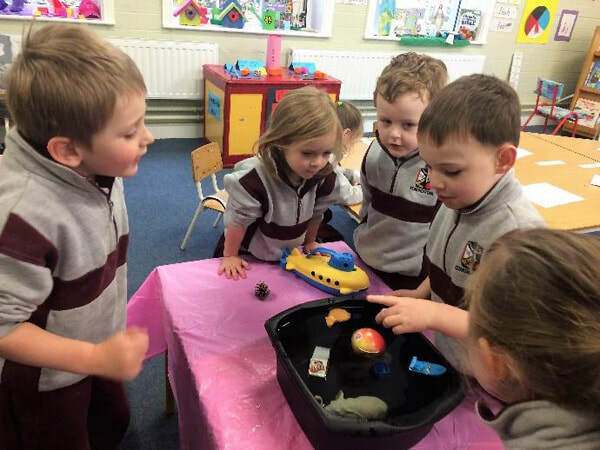 During Science Week we did lots of experiments on Floating and Sinking. 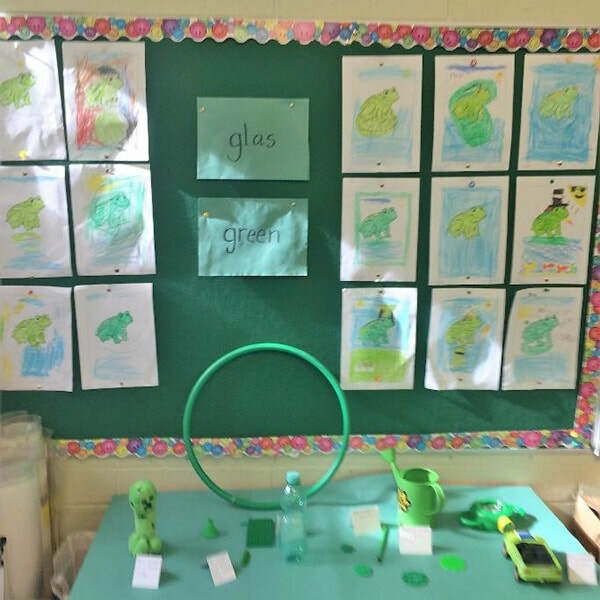 We discovered that things made of wood are great at floating and so are things which have air in them. 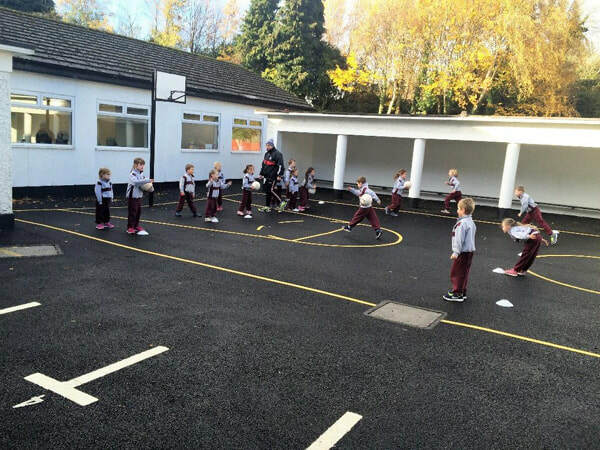 Friday is GAA day and we love it! Seán from Wanderers GAA club keeps us on our toes. 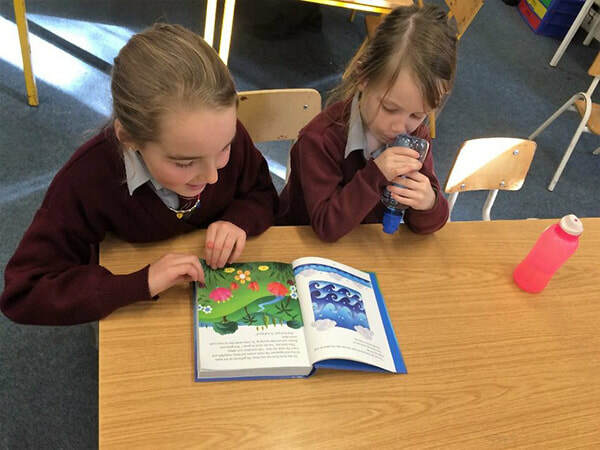 Library time on Friday is great. We get to choose two books to bring home. We have been busy learning the “Safe Cross Code”. 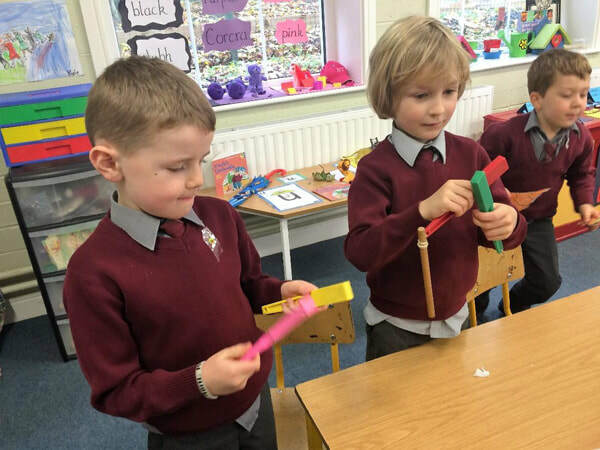 Don’t we look great?We are still learning all our new sounds. 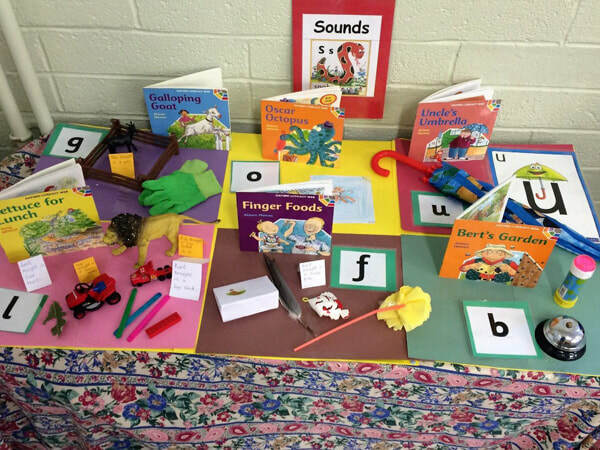 Check out our Sounds Table. 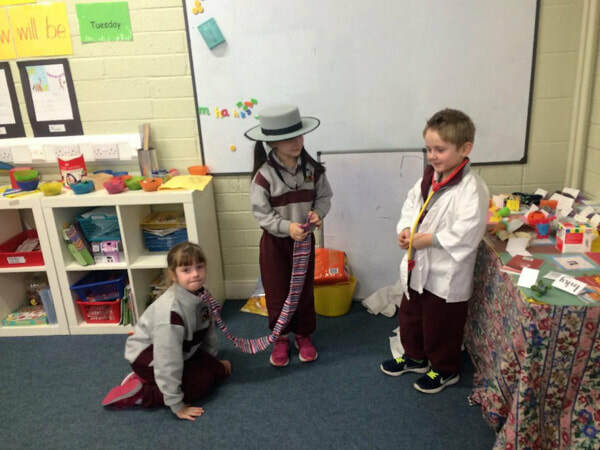 Drama is great fun and we really get to use our imagination! 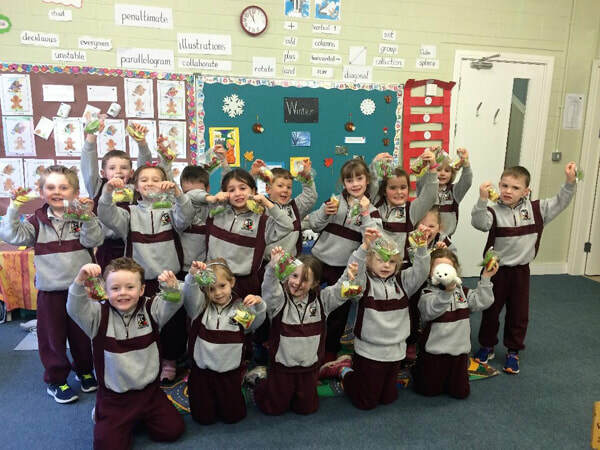 Food Dudes was a great way of helping us learn about fruit and vegetables and we have really enjoyed tasting all the different types each day. 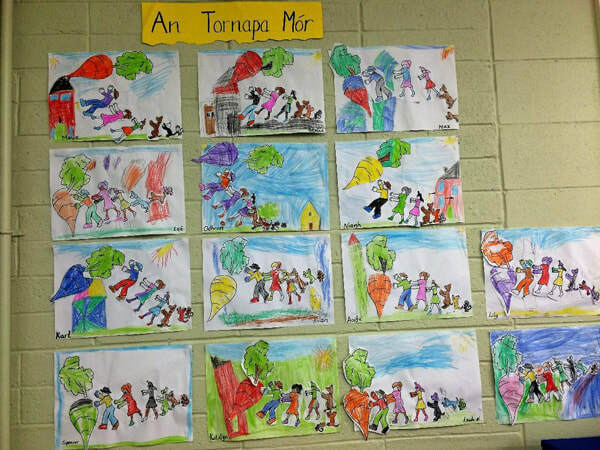 We worked hard in Irish learning the story of “An Tornapa Mór”. We enjoyed colouring and cutting out the different characters but of course the best bit was when we got to act out the story! 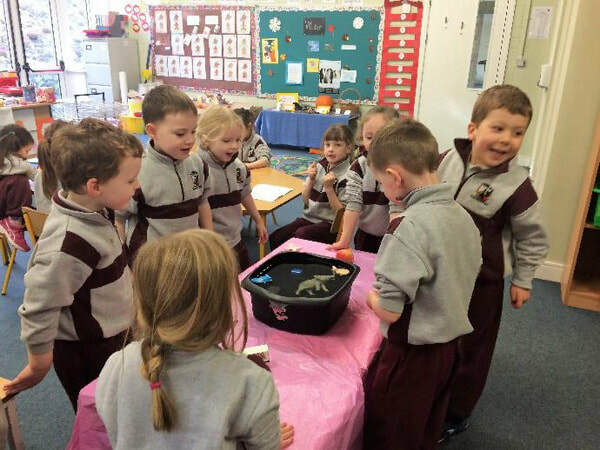 We had great fun celebrating Science Week. We experimented with magnets and discovered that magnets attract metals which contain iron. We learned a new word “repel”. Magnets have a north pole and a south pole. A north pole and a north pole will repel each other. A north pole and a south pole will attract each other. We could actually feel the invisible force of magnetism – it was amazing! 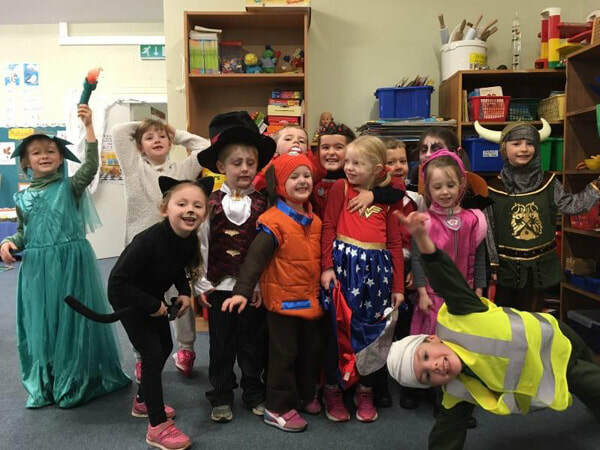 We just love it when our predictions are correct! We have to concentrate when we are classifying materials as Magnetic or Non Magnetic. 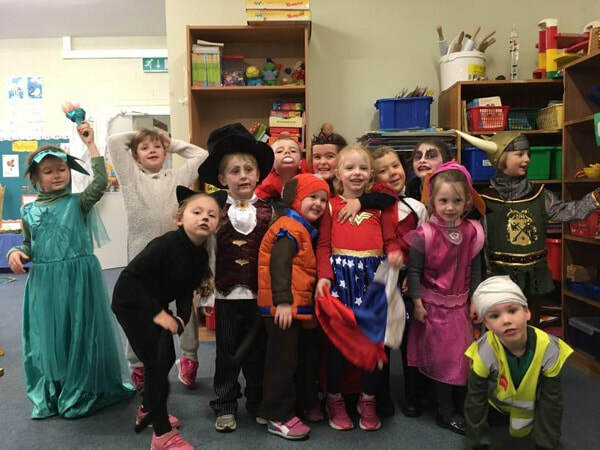 Junior and Senior Infants really love dressing up! 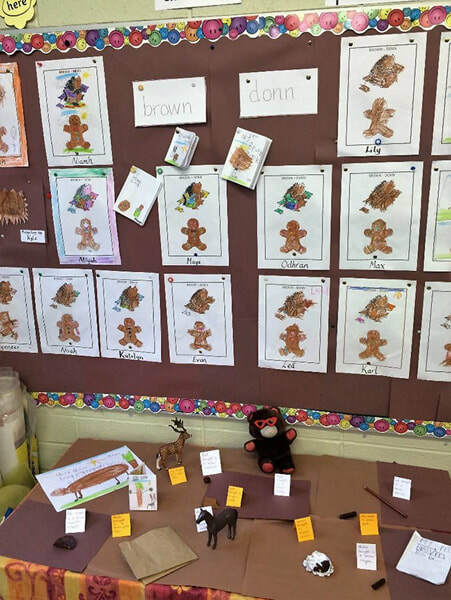 Our classroom was a different place at Hallowe’en. 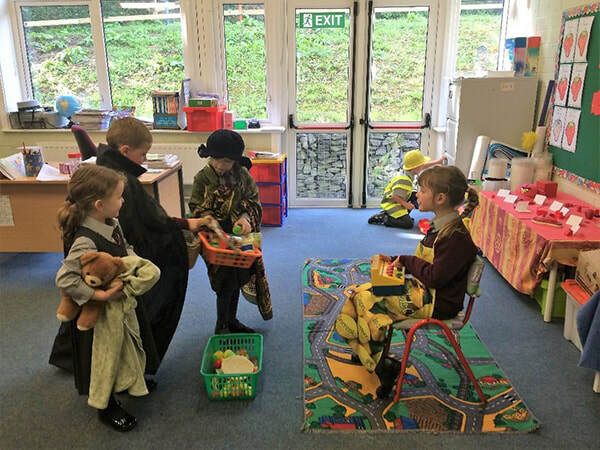 There were lots of strange visitors that we did not recognise! 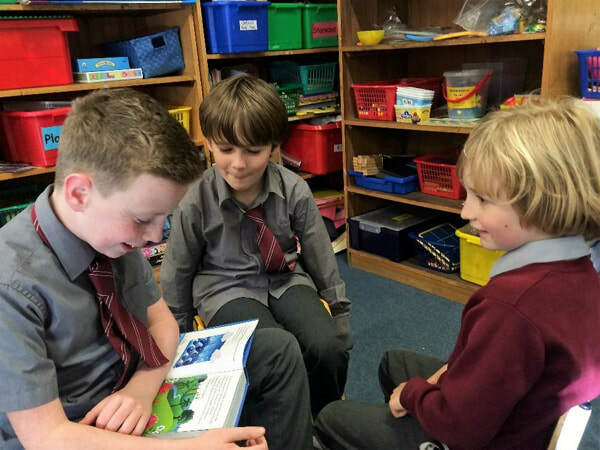 Junior and Senior Infants had great fun Buddy Reading with 3rd and 4th class recently. 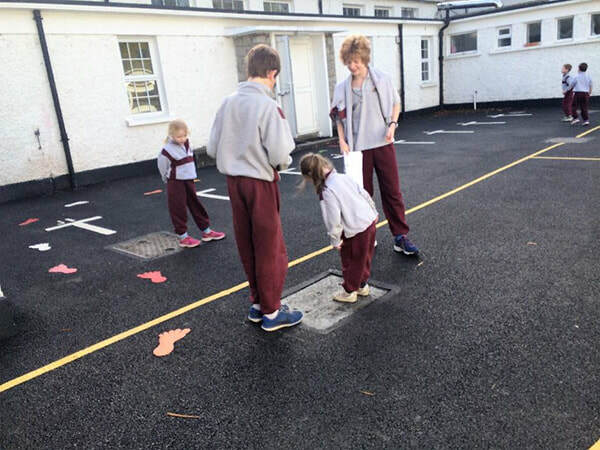 The older children gain great confidence and the younger children really enjoy the experience. 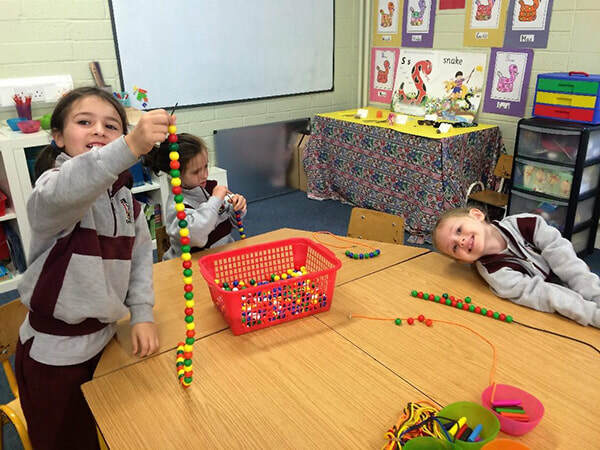 What a great time we had during Math’s week. 5th and 6th brought us on a math’s trail around the school. It was cool. 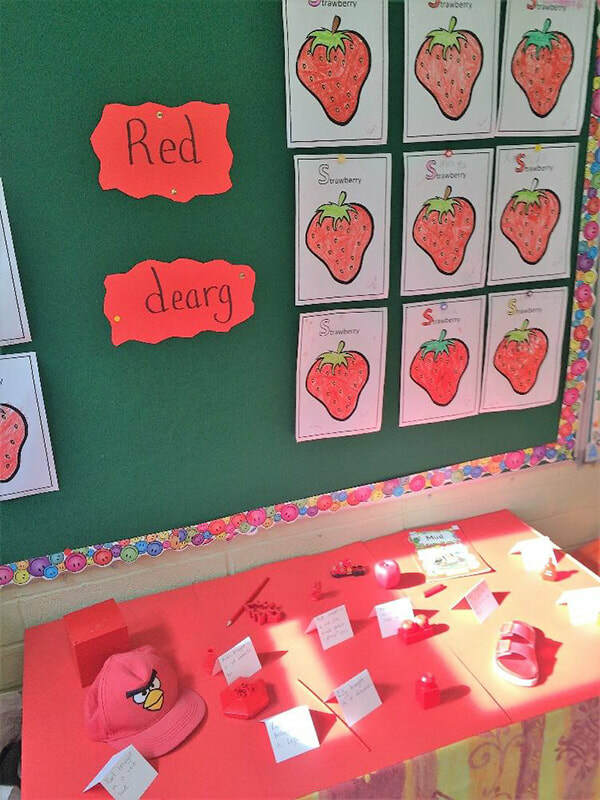 We continue to learn a new colour each week. We love bringing in items from home. 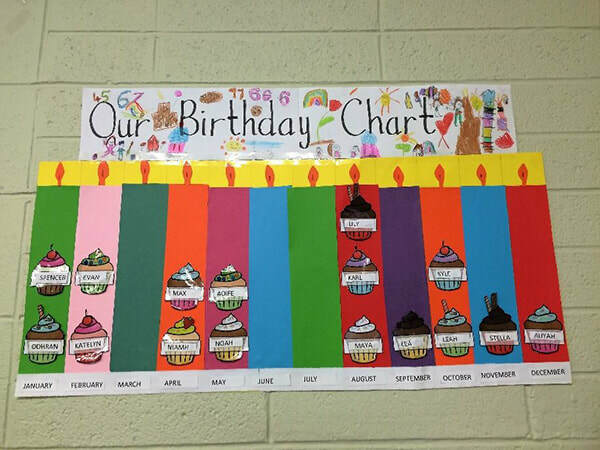 Birthdays are very special days in our lives. We like to celebrate them! 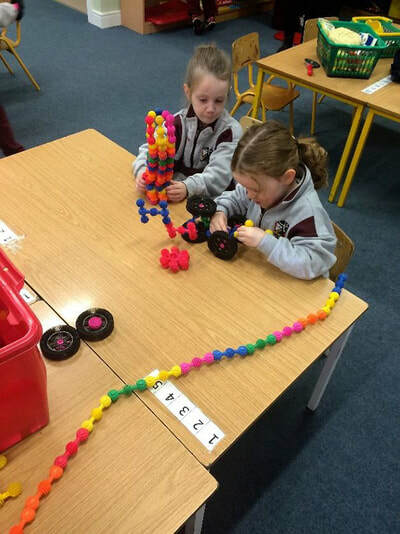 Junior Infants have been working hard on extending patterns. 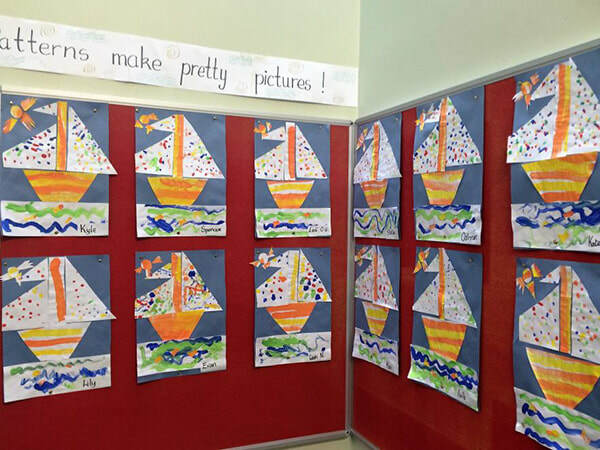 We made some pretty pictures using different patterns – zig zag, wavy, spotty and vertical and horizontal stripes. 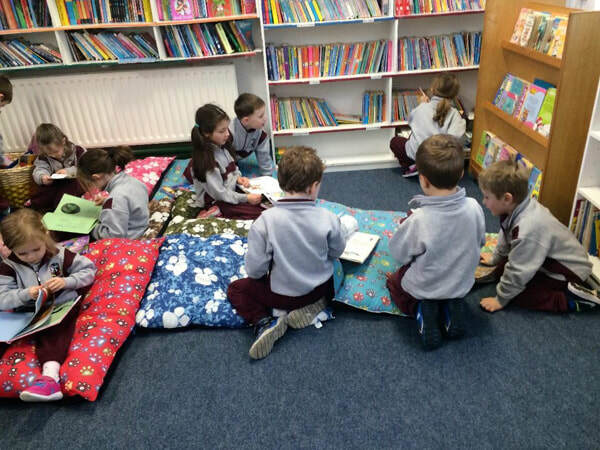 Junior Infants have really settled in well and they have made lots of new friends in our lovely school. 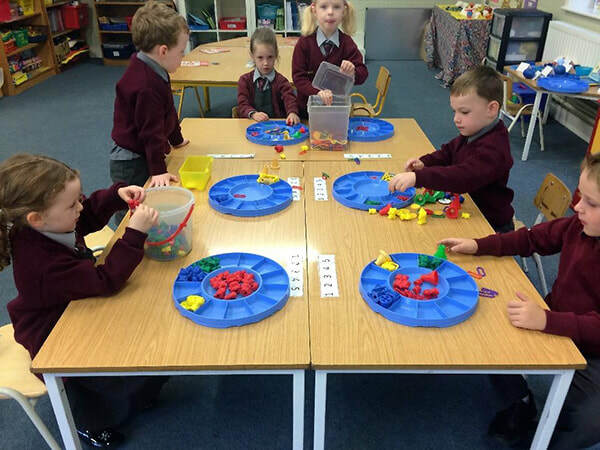 They have been busy sorting, classifying, matching and counting. 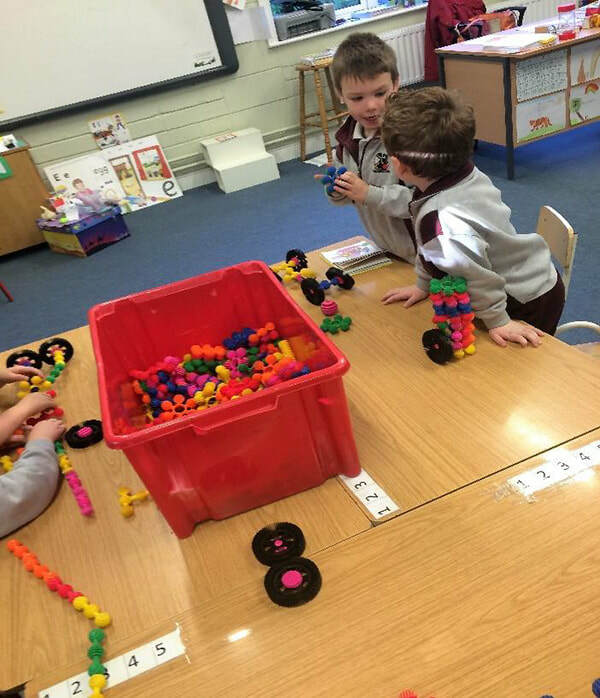 Senior Infants have made them feel very welcome. 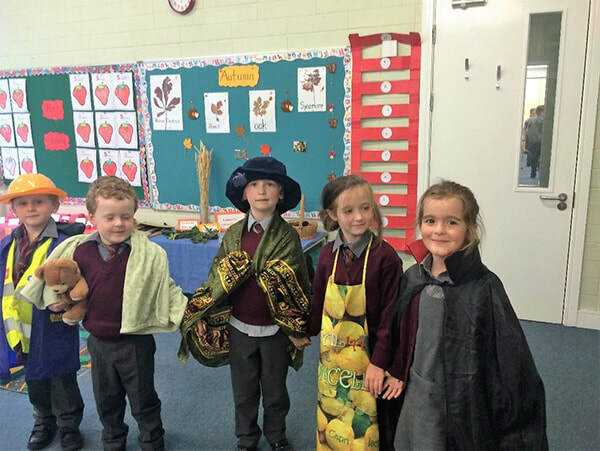 All our infants enjoy showing off their talents during drama time. 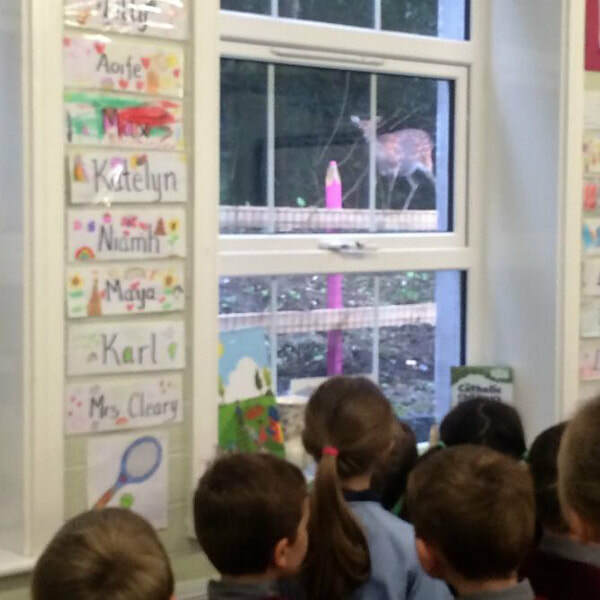 We had a lovely visitor last week – a little fawn came to peep in at our window to see what we were learning. 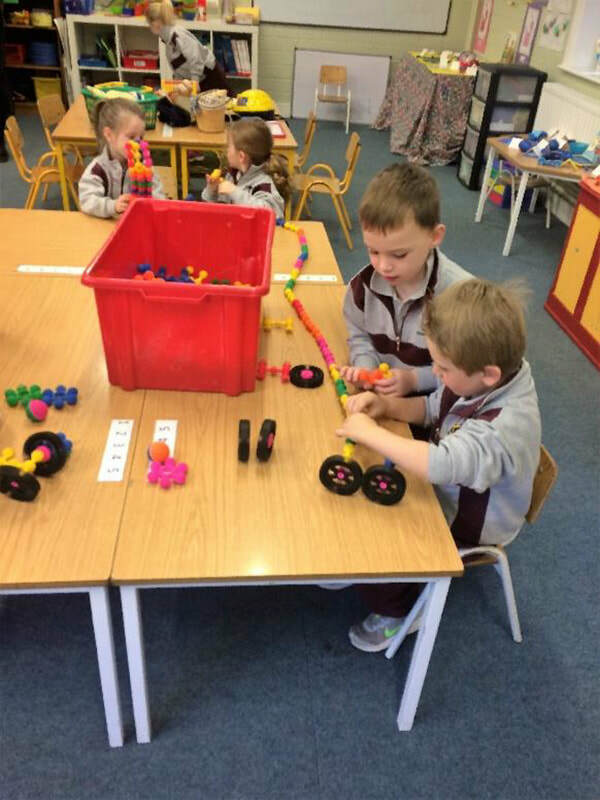 We love activity time when we can do lots of early mathematical activities and extend our vocabulary. 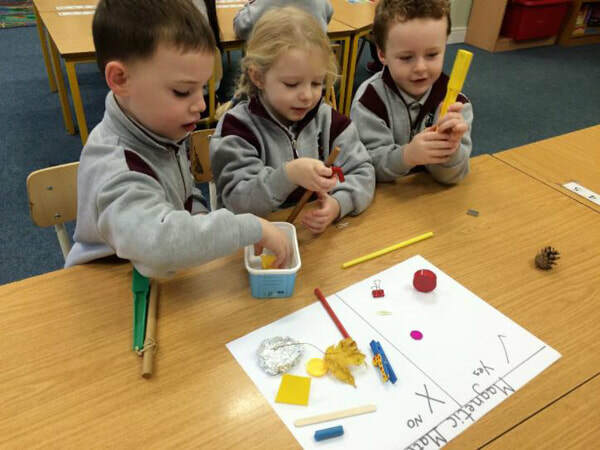 Junior Infants are fantastic at sorting objects into colour sets. Senior Infants love making patterns. 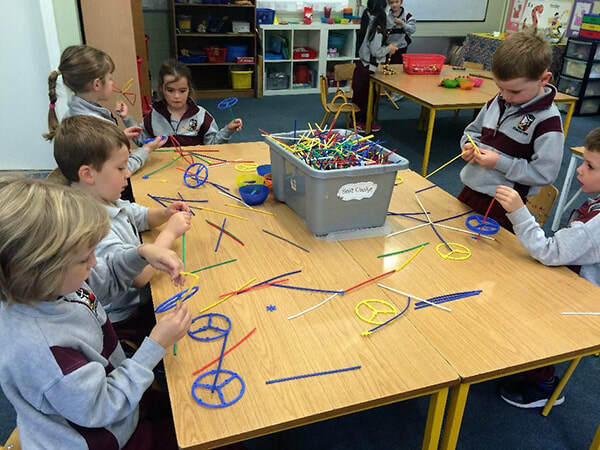 Making straw constructions takes lots of concentration. 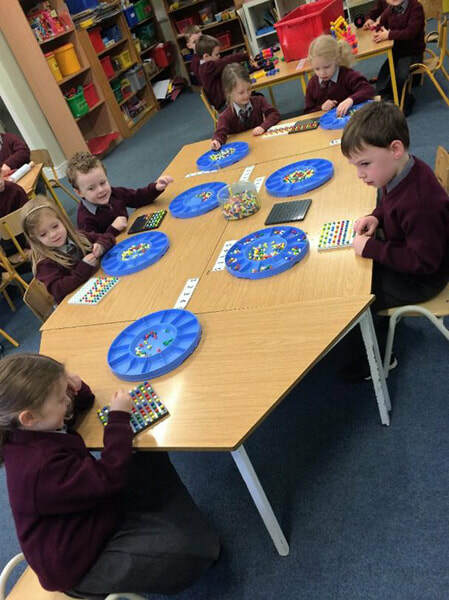 Each week we have a different colour table. 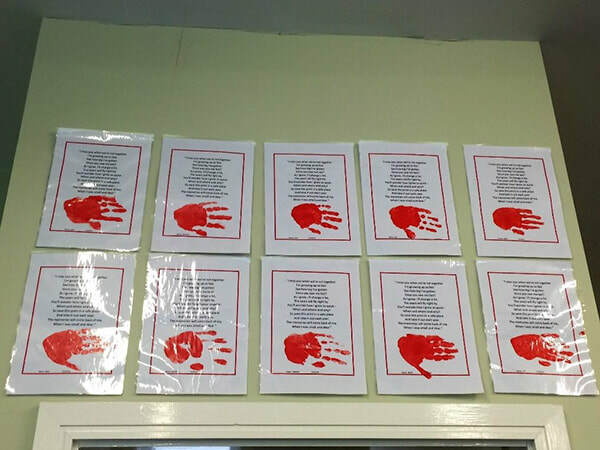 We have had dearg, gorm, glás, bán, corcra agus buí. 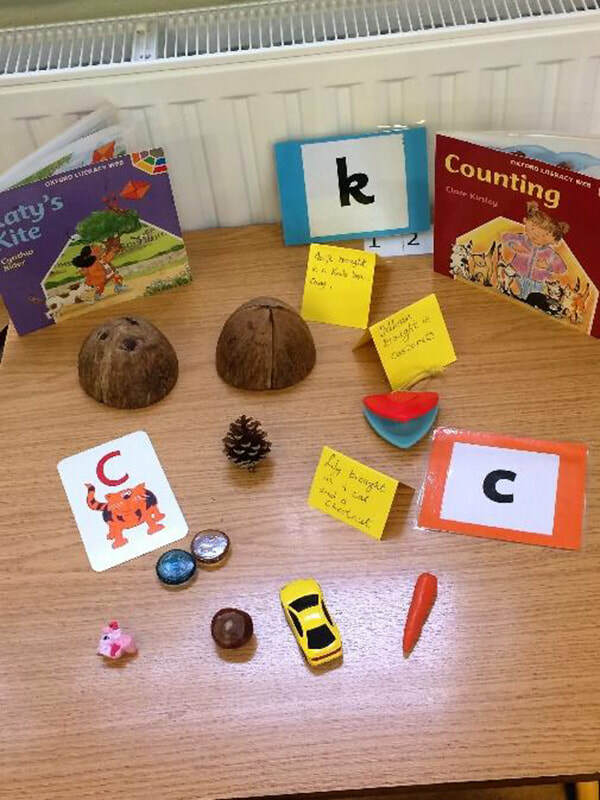 The children are terrific for bringing in little items from home. 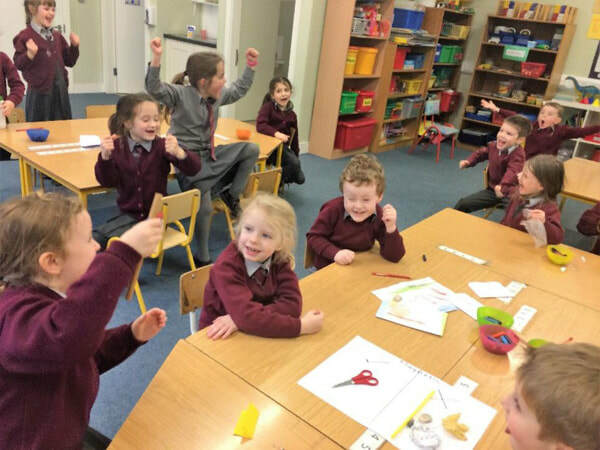 Senior Infants are fantastic at reading all the little labels. 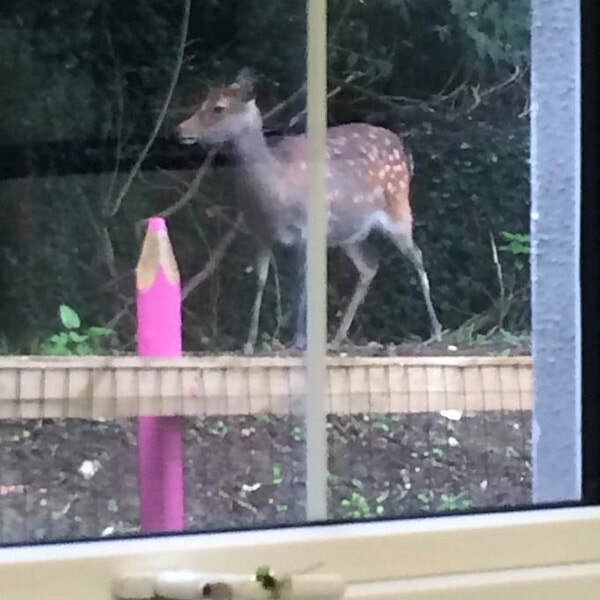 We are really enjoying taking nature walks around our new Sensory Garden. 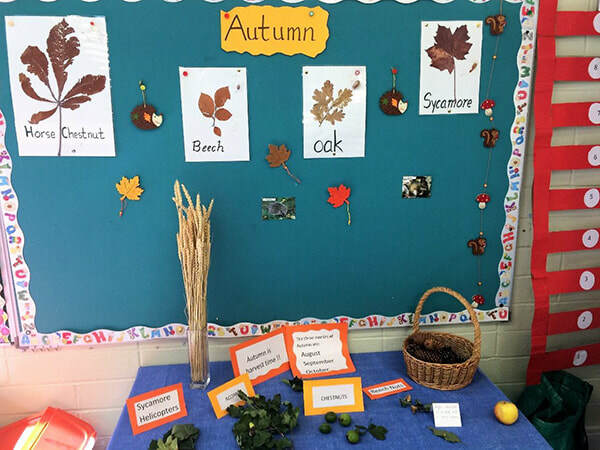 We have collected lots of leaves, chestnuts and beech nuts. Kyle brought in some acorns and we planted these. We are hoping that a little oak tree will grow in the spring time. Do you like our lovely leaf rubbings? Play Dough - making our numerals and 3d shapes. We loved making handprints – it was nice and messy! 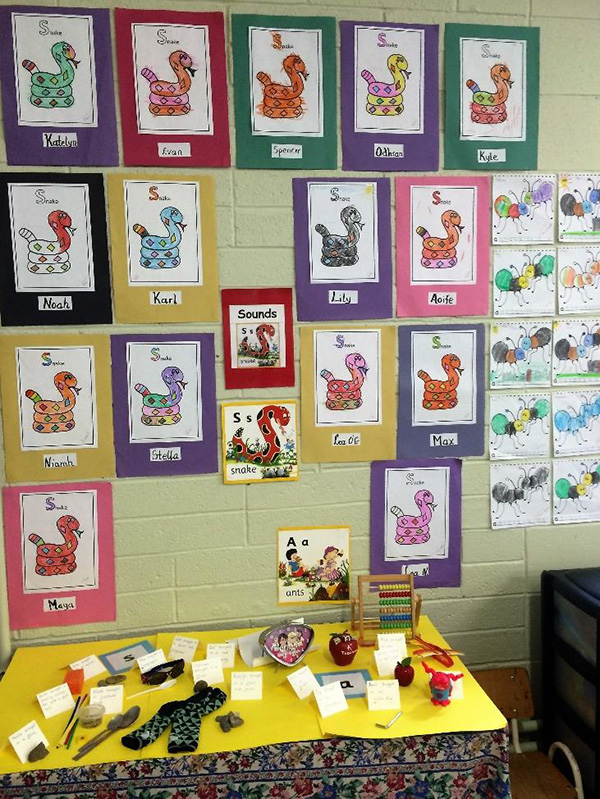 What do you think of our snakes? 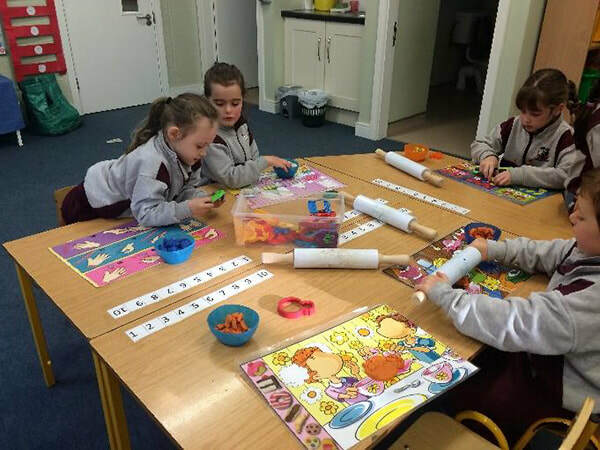 The children in Junior and Senior Infants are working hard and enjoying school. 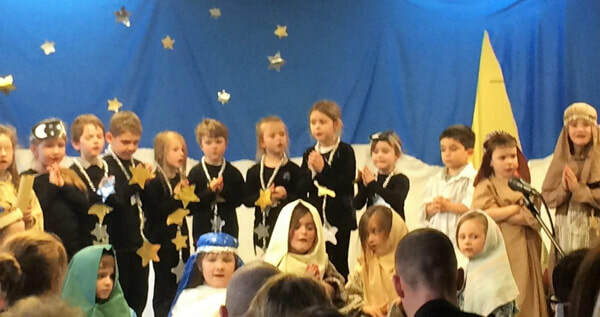 They really were fantastic in their Christmas Nativity show and all the Mams and Dads were very proud of them.